We all know that some people are naturally well endowed with well-balanced physique but it also a rude fact of life that many of us are not gifted with one. We also see many people in the gym with bulging quads in their upper body but ridiculously thin below their knees. It is clear that they haven’t given due importance to building their leg muscles. It is, therefore, essential to include specific leg workouts to build a well-proportioned physique. With appropriate training anyone can develop their calf size. 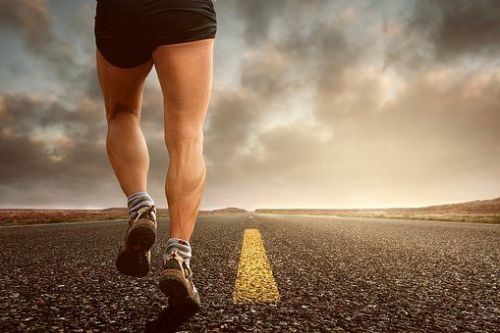 The lower legs consist of muscles known as – ‘Gastrocnemius’, ‘Soleus’ and the ‘Tibialis Anterior’. Gastrocnemius & Soleus make up the calves. The gastrocnemius muscles are found on top of the Soleus muscles. Tibialis Anterior, though small, is important because a weak Tibialis Anterior might increase the risk of ankle injuries. Any movement involving flexing of the ankle strengthens the Tibialis Anterior. While the Gastrocnemius muscles contribute to the outward appearance & size of the calves, it is important that Soleus muscles are also exercised since each of them has their unique functions. Standing movements that raise the body up with toes work the Gastrocnemius, seated calf raises work for the Soleus and reverse calf raises work for Tibialis Anterior. Given below are 8 easy and effective calf exercises. Try to include them into your workouts - 3 sets & 15 reps each, at least a couple of time a week. 1. Sit on a box or bench/ chair with your feet flat on the ground, holding dumbbells on your knees. 2. Raise your heels off the ground as high as possible. 3. Lower your heels back slowly to the ground and repeat. 1. Be sure to squeeze the calves at the peak of the movement. 2. Perform the movement gently. Also, read 6 Effective Calf Workouts To Get Perfect Calf Muscles. 1. Hold a dumbbell in your left hand. Use wall or a rail as a support. 2. Stand on the edge of a box or raised surface with your heel & mid foot of your left leg. The ball of your left foot hanging off. Your right toes resting on your left ankle. 3. Raise your left heel as high as possible. 4. Pause and slowly lower your heel down below the raised surface until you feel a stretch in your calf. 5. Repeat and do equal reps on both legs. 1. Don’t make bouncy movement. Control your movement throughout. 2. Ensure squeezing the calves at the top of the movement. 3. To achieve more stretch, lower the heel as far as possible. 4. Legs should remain straight throughout the movement.